Kyoto Animation is one of Japan’s most prominent and recognized anime studio. They pioneer the industry by creating high-quality anime which is almost always positively received by both the audience and the critics. 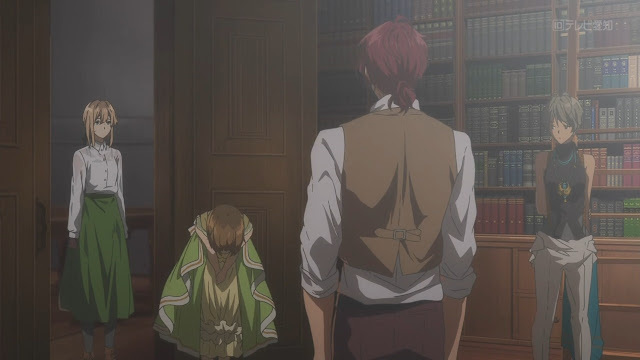 Critics have lauded Kyoto Animation for their mastery over the genre that they are currently tackling with or even revitalizing a genre that is dying out or is unknown to the audience at that time, their habit of focusing on character more than everything , and the high production value that they always give to any of their production. All while the audience thoroughly enjoyed their anime through it’s sheer force of being highly entertaining or simply looks good. It is no secret that I am a fan of their work, a huge fan of Kyoto Animation. I have been following them since they released K-ON! And The Melancholy of Haruhi Suzumiya is my first exposure to them if I am being honest, although I watched the anime at around 2011, right after finishing both season of K-ON!. From there on, I never missed any of their show, save for the second season of Free!, and thoroughly enjoyed them. However, despite my love for Kyoto Animation, there are several anime that I do not enjoy and think that they need to either work on that genre more or just avoid it altogether, which is Kyoukai no Kanata and Musaigen no Phantom World. Both action-oriented anime is just not the forte of Kyoto Animation and they, in my opinion, flopped at making those due to several problems. However, that is a subject for another article. The subject for this article is Violet Evergarden. Many people, including myself has realized regarding one thing about Kyoto Animation. The studio did everything but one, which is capturing global audience and having a worldwide interest. Sure, they are popular in some parts of the country, but not that much popular, as many of their anime are normally eclipsed by a more mainstream product, such as Shingeki no Kyojin, Sword Art Online, even One Punch Man. Don’t get me wrong, all of those anime are good, but Kyoto Animation’s production is as good as them, and even better in my opinion, but they just couldn’t capture those audience, particularly because of the genre of their works that is not to the taste of the masses. Violet Evergarden made by Kyoto Animation in hopes to gain worldwide audience. 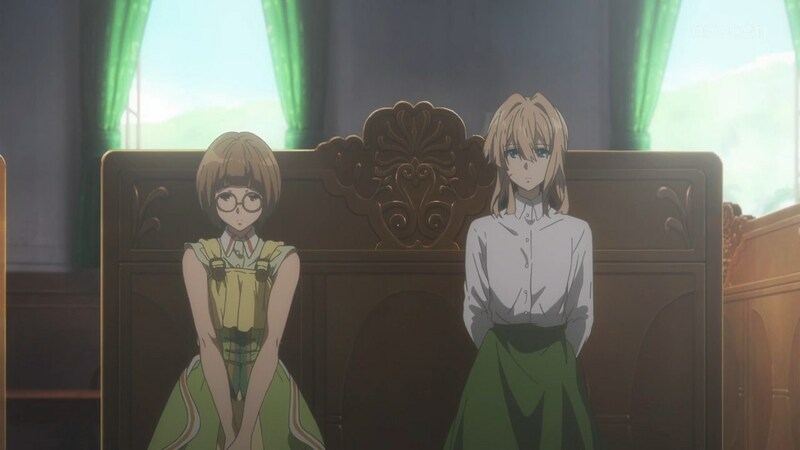 However, Violet Evergarden has captured many interest from the mass despite only being airing for just two weeks at the time of writing this. Many people have been talking about it, some, who are not familiar with Kyoto Animation works, are already hyped for Violet Evergarden before the airing begins. This leads me to thinking that Violet Evergarden might be Kyoto Animation’s first step in achieving their dream of capturing the global interest for their products. There are several factors that made Violet Evergarden unique in terms of their production, and evident at it’s attempt in capturing worldwide audience. 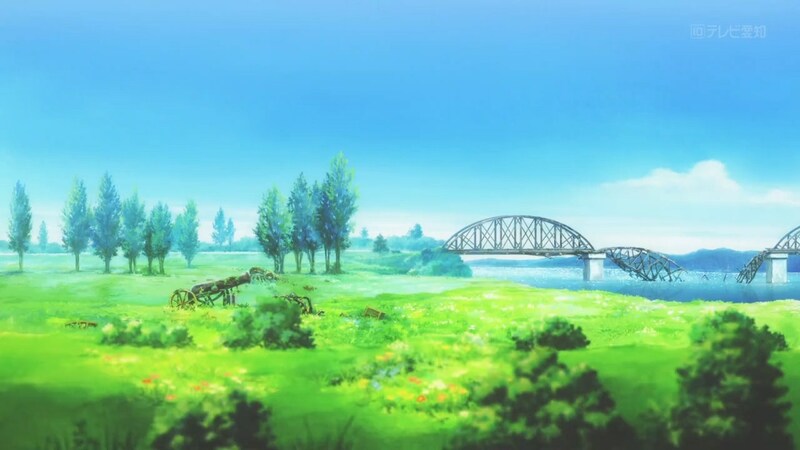 One thing that always made Kyoto Animation different from the rest of the studio in the anime industry is their focus on quality over quantity, as many of their works focuses on delivering it’s content and it is no surprise to see them high in terms of production value, such as having crisp animation, colorful and majestic background, and a lively character. 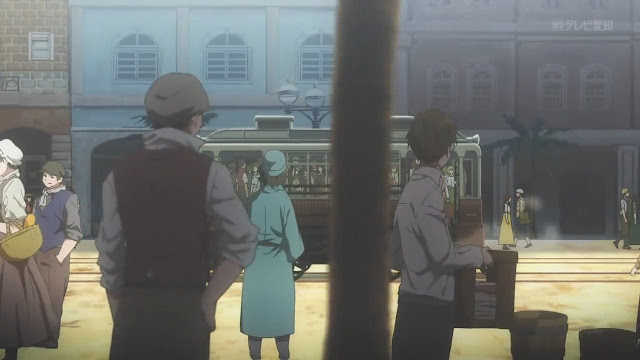 However, in Violet Evergarden, it is evident that Kyoto Animation goes way beyond their usual call of duty in making this anime, as it is unusually high in production value, whether it is animation or background, with this kind of quality normally seen only when they are producing a movie, such as Koe no Katachi or K-ON! Movie. So far, Violet Evergarden has a very high production value compared to the rest. Some of Kyoto Animation’s works are not released in English, with some unlicensed by an English-language anime publisher for a long time before they finally released it. An example for this is Hyouka, which aired in Japan on 2011 but received their English-language release on the west in 2017. 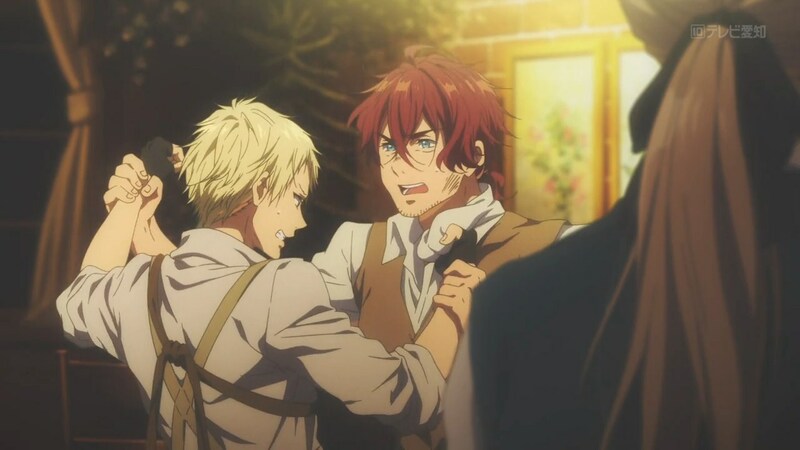 However, in releasing Violet Evergarden, Kyoto Animation opted to release it in multiple region, complete with language dub that correspond the region that it was released. For the English-language release, the one who distributed the series is Netflix, arguably one of the biggest stream provider in the world, and this show is even reffered to as a Netflix Original Show. It was easily seen through this factor that Kyoto Animation was seeking the global audience, but there are several factors which underlined that line as well. It was released both domestically and internationally. Kyoto Animation’s approach for their voicework is notable for including a newer or rookie voice actor and pair them with a more experienced or talented one in order to give the rookie more experience and cut cost as well. 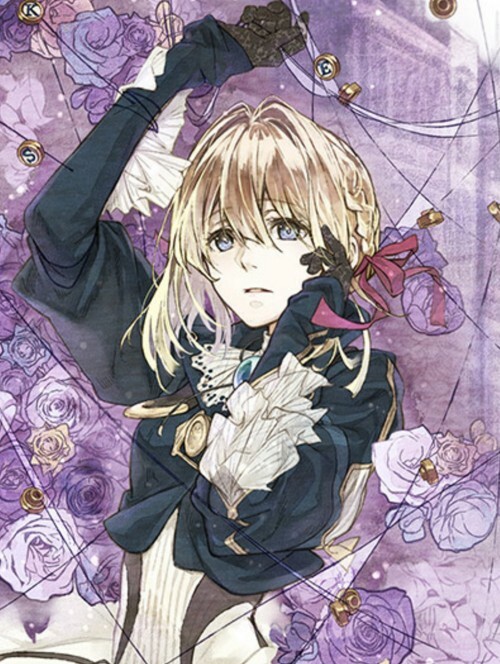 Violet Evergarden, on the other hand, had a line-up of a more talented voice actors ,which is already popular to the audience, that helmed the characters, such as Yui Ishikawa, who is known for voicing Mikasa Ackermann in the Shingeki no Kyojin series, as the voice of Violet Evergarden, Takehito Koyasu, who is known for his role in One Piece as Aokiji and Jojo’s Bizzare Adventure as Dio Brando, voices the character Claudia Hodgins. Despite the great line-up for the Japanese Dub, they also had a very talented voice actors voicing the character in the English Dub, something that is rare for anime, such as the names of Erika Harlacher, Cherami Leigh, and Christine Marie Cabanos. As I stated before, having a well-known voice actor for an English release is particularly rare for anime in this era, since the popularity of anime is waning in the region which had English as their main language, thus making the English voice a little bit cheaper or less known to the mass. However, Violet Evergarden release, evident through those names, indicated that they are aiming the western audience to pick up the series as their English voice are far superior than those I normally heard in other English-dubbed anime. The voice talents used for Violet Evergarden was star-studded. All anime seeks to do great at their first outing so that the audience sticks to the anime until the end, as they say that first impression are everything. When a person’s first impression to an anime is already negative, they will view that anime as negative even though that anime is already doing good, vice versa. An in the airing of the first episode of Violet Evergarden, the first episode of the anime was so captivating that people had already rated the series so highly despite only being the first episode. The first episode was magnificent in terms of visual, captivating in terms of story-telling, and phenomenal in almost everything. Simply put, Violet Evergarden’s first episode is the dream of so many anime already airing or planning to air. However, why do I say intentional? While a first episode is good, the second episode must absolutely follow suit. While the second episode of Violet Evergarden is good, it is not as magnificent as the first episode. As such, I believe that they are intentionally making the first episode to be as majestic in order to capture the interest of the audience and made sure that they land a lot of viewer for this series. The first episode was a cut above the rest. If you are familiar with the works of Kyoto Animation, you know that they are normally tackling a theme which is rather unknown to the public at that time, such as when they produced Hibike Euphonium, whereas the public interest for marching band is not that high, as well as swimming in the form of Free!, Theme park in the form of Amagi Brilliant Park, and even Monster girls in the form of Kobayashi-san Chi no Maid Dragon, as the popularity of that genre is not as high as when Monster Musume no Nichijou aired. 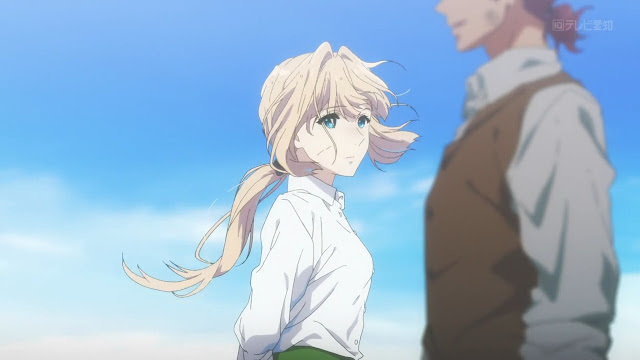 Through Violet Evergarden, which is centered around an a young woman trying to find out the meaning of love, it is easily seen that Kyoto Animation seeks to garner an audience interest by using a universal theme which many in the public has shown love for. The theme of Violet Evergarden is as universal as you can get, and it was widely accepted. One of the many aspects of the anime which is sometimes not in the favor of the western audience is it’s setting. The setting is normally set in Japan, and commonly, in high school, which has drawn boredom from the public. 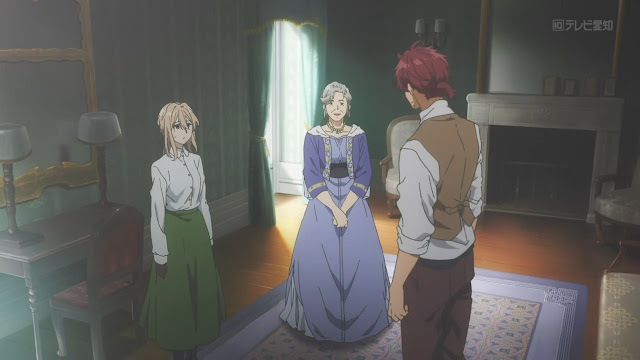 Violet Evergarden, on the other hand, utilized a more western-oriented setting, presumably in Victorian era England due to their name and settings but I don’t know and don’t quote me on that, so that the audience hailing from the western region can get familiar with the setting and their name more. This is the simplest yet perhaps the strongest aspect yet, since using a more western-oriented theme and setting can help an anime get over the western audience easier. Through many things, it can be seen that the show is not set in Japan. As I talked about earlier, Kyoto Animation works tend to have a high production value, evident in their visual. However, Violet Evergarden turned it up into eleven in this manner. As I spoke earlier, their visual matched those with the one that they normally do for their movies, and this is by far the pinnacle of television anime as none can even close in their attempts in making their anime looks as good as this. This, too, is not done just for the sake of looking good. Instead, to gather an audience interest through a captivating visual, as people tend to flock around a good-looking anime. Many of these people are seen in the community, as there are people who watched Violet Evergarden simply because it looks good. Visually, Violet Evergarden stood out as the best and finest looking of any Kyoto Animation works. All of those are the factors which proved the fact that Kyoto Animation is seeking a worldwide recognition through Violet Evergarden. 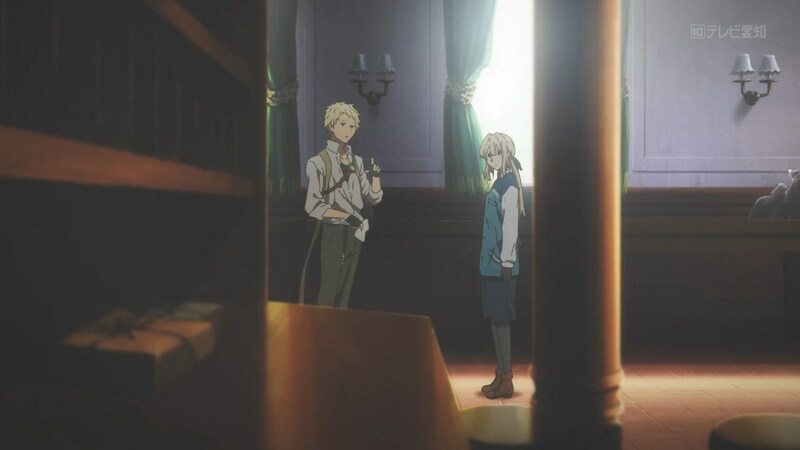 The production value, the worldwide release, and everything, is their effort in making both Violet Evergarden well-known and widely accepted in the west, as well as it is in Japan. 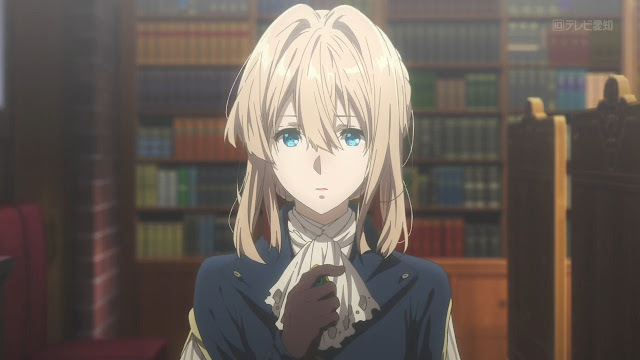 Violet Evergarden is already captivated me through it’s first and second episode, which is the only two episodes that have aired at the time of this writing, and I can’t help but wanting to watch the next episode. This is the effect that Kyoto Animation perhaps seek to achieve in producing this series, but I don’t know. Aside from loving this series as a whole, I also love Kyoto Animation as a studio, as I believe that they are the Japanese-equivalent of the Pixar animation studios in the United States. They are similar in their belief and ways to achieve their animation target, such as using a more obscure theme to gain interest, as well as making sure most of their work received the same high-production value, although Kyoto Animation is dreaded for their in-house works up until Amagi Brilliant Park and having almost a similar character model in many of their works. Despite all of that, Kyoto Animation always came through them all in their own way. It’s just that , Violet Evergarden is in a league of it’s own. There's no denying that Violet Evergarden is doing a really good job right now.